You’re bombarded with questions about how your students can raise their finals grades. Your nights are filled with grading. And summer is so close you can taste it. This can be a very stressful time of year for teachers and students alike. Here are some tips that can help you cross the finish line with your sanity intact. It can be difficult to keep students in their seats when they are counting down the days until summer. Take a break between activities to move around the room, or hold a portion of the class outside if that make sense for your situation. Keep home life as simple as possible. The final weeks of school may not be the best time to start a new workout plan or dive into home improvement projects. 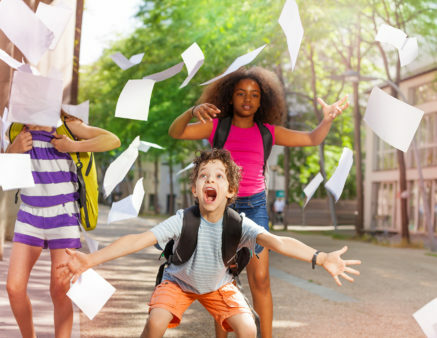 Save as much energy as possible for school- you’re going to need it! Start planning for the fall. While there is an overwhelming amount of things to do this time of year, the more you can reflect and prep, the easier your transition back will be in the fall. This could be anything from asking your students for feedback, to cleaning out one drawer per week. Remember that not everyone is looking forward to the end of school. Some kid have less than ideal home lives and school has become their safe space. Or maybe they don’t have any exciting vacations planned for the summer and hearing their peers talk about theirs can leave them feeling left out. Connect with those students and see if there are ways for you to help with the transition. Remind yourself of the impact the end of the year can have. It can be easy to spend your days counting the moments till school is out, but you have a few more weeks to truly make an impact on your students’ lives. Consider writing each of them a personal note or just make a conscious decision to enjoy these final days with them.